It’s Tuesday night at The Complex, where it’s likely you’d be taking in a concert and shaking some serious booty. Yet this crowd is far from rowdy. Most of the 20 or so men and women gathered are bent over spiral notebooks and legal pads, writing or studying intently, perhaps sipping on a drink. The only hint as to the entertainment that will eventually occupy the small wedge of a stage in the corner comes from the television over the bar, playing Comedy Central’s Tosh.0. For a night devoted to open-mic comedy, the mood is surprisingly serious. The ranks of funny men and women have swelled, inspiring comedians to launch weekly or monthly showcases throughout the Wasatch Front. They’re diving into subjects that might be surprising to those who assume comedy in Utah is family-friendly and innocuous. And they’re dealing with the clashes that inevitably emerge in a highly competitive artistic field. 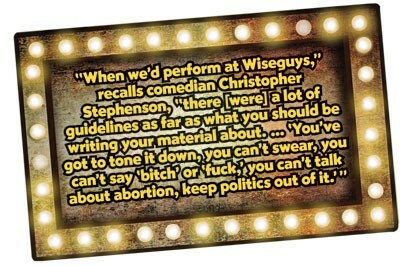 While Keith Stubbs’ Wiseguys comedy clubs have been the primary stages for comedians for more than a decade, in the past two to three years, comedy shows have begun appearing at more and more venues. In February 2010, comedian Steve McInelly launched a monthly showcase at Club DJ’s in Kearns. Comedians Greg Orme and Christian Pieper started a regular “Cat Fashion Show With Jokes” at Muse Music Cafe in Provo. Murray’s 5 Monkeys features a Thursday-night open mic. And, most significantly, there’s The Complex, which, in addition to its weekly Tuesday-night open mic, offers a monthly “Comedy With a Complex” showcase, primarily featuring local comics, as well as touring comics occasionally. 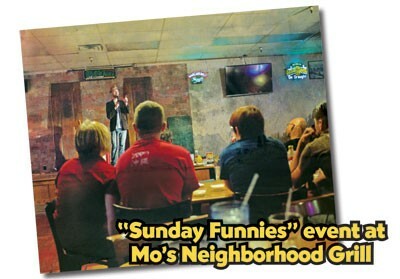 These all followed the lead of the “Sunday Funnies” comedy night at Mo’s Neighborhood Grill. Stubbs estimates—though he notes that “it all depends on your definition”—perhaps as many as 100 local comedians are regularly performing in Utah. Even a little more than a decade ago, the prospects for a thriving local stand-up comedy scene wouldn’t have seemed particularly bright. In the late 1990s and early 2000s, a few Utah venues—including the Comedy Circuit in Midvale, and Johnny B’s in Provo—brought in national touring comedians. For the locals, things weren’t particularly thriving. “It was dismal,” says Rodney Norman, a Utah native who had started doing comedy in Kansas City before relocating back to Utah circa 1999-2000. In addition to the occasional shows run by eventual Wiseguys founder Stubbs at Brewvies and Fats Bar & Grill, Norman recalls, “There was one open mic at a VFW bar in Highland … and that was pretty much the scene. Stubbs—a touring comic with a business background in his pre-comedy career as a stockbroker—had already run a club called Laughs (originally Laffs) in Ogden from 1996 to 1999. Unable to reopen as Laughs because he’d sold the club and the name before a brief relocation to Seattle in 1999, Stubbs instead found a one-time church building in West Valley City that opened as Wiseguys in February 2001.